It’s almost breeding season again! It’s a time when foals dot the countryside and we can all daydream about their amazing future careers. Have you decided to breed a special mare for the first time? If so, there are several factors that can influence her chances of successfully delivering a foal next year. A mare that has never had a foal before is called a “maiden mare”. Just like women, a mare is more fertile in her younger years. As a mare ages, the likelihood of her conceiving decreases. Even a mare in her early teenage years may have a hard time becoming pregnant. This does not mean that pregnancy is impossible, but it does mean more intensive management may be required. Before investing time and effort into breeding your mare, a breeding soundness examination should be performed. The goal is to make sure the mare is healthy enough to carry a foal to term. 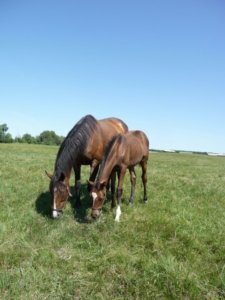 Responsible breeding includes consideration towards physical and behavioral traits of your mare, as certain traits are genetic and can be passed on to her offspring. Reproductive conformation needs to be considered as well, as it can greatly affect the chances of a mare becoming pregnant and maintaining a pregnancy. Rectal palpation and ultrasound to examine the ovaries and uterus and determine stage of heat cycle. Endometrial biopsy to obtain a sample that will be graded on degree of degeneration and fibrosis, which correlates to a percentage likelihood of carrying a foal to term. Cytology and culture to determine if inflammation or infection is present and guide any treatment, if necessary. In Washington, breeding season naturally takes place between April and September. It is best to examine your mare near the beginning of breeding season, as this leaves time for multiple attempts at pregnancy in case she does not conceive easily. Stallion schedules: If using AI, what days do they collect the stallion and what days will they ship? What the stud fee includes: Do you have a live foal guarantee? If you need to breed your mare more than once in the season, is there an additional cost? It’s important to read the stallion contract carefully and clarify any questions you may have before signing it. Your mare will only be fertile and receptive to breeding for a small window of time every 21 days. If you are choosing artificial insemination or breeding to a popular stallion, timing is crucial. It will likely require multiple veterinary visits in order to determine appropriate time to breed and to allow for the best chances for conception. Once the mare has been successfully bred at the right time, the hard work isn’t over. There is no reliable blood test for early pregnancy in horses. An ultrasound examination at 11-14 days after ovulation is advised to confirm pregnancy. It is also important to identify twin pregnancies. Twins in horses rarely survive and put the mare in danger. An additional ultrasound is recommended at 30 and 60 days gestation, as horses are known to experience early loss of pregnancy. During pregnancy, alterations will need to be made to key aspects of normal management, including vaccination schedules and nutrition. It is also important to consider how birth may affect your mare. Problems during foaling can be life-threatening and it is vital to ensure you have proper facilities and ability to monitor her closely. The path to successful pregnancy can take time, money, persistence, and a little luck. It is important to have a thorough discussion with your veterinarian before breeding your mare. Lastly, take the time to consider the big picture and remember that there are many horses in the world that are in need of homes and many foals that end up unwanted as adults. Be sure to have a plan for your intended foal in the years to come. Viveka Rannala, DVM, born and raised in Canada, decided she was to become a veterinarian at the age of four. Following graduation from the Ontario Veterinary College in 2017, she completed an internship at Peninsula Equine Medical Center in Menlo Park, CA. Since then, she has moved closer to home and joined the team at Northwest Veterinary Clinic of Stanwood working exclusively with horses. She is a member of the AAEP, AVMA, and WSVMA.